one of my must-haves for fall is a great flannel...and what better than one in classic red. it's great for chilly fall mornings and nights, perfect for the pumpkin patch, and festive come christmas. while i love all patterns from gingham to checks and tartans, i've been wanting to add a buffalo plaid to my collection. like everything else, though, the perfect one is hard to find. i came close with this one last year but hope to score 'the one' this year. what's one thing you hope to pick up this fall? The pattern looks good on you, I thought I was done with plaid but I may give it a second thought now! I want to add a sweater dress to my closet. I hope you find your prefect flannel this year. That color combination really makes the plaid more striking. I haven't worn plaid in years but I may be changing my mind. Totally feel you. And those are harder to come across than I thought! I love a good plaid though. It's my inner punk! buffalo plaid is my favorite plaid! you look so pretty -- love it with the red lips. I am not a fan of plaids generally speaking, but I find these smaller patterns with nice color contrasts rather flattering. You look awesome! Such a pretty shirt. Didn't know it was called buffalo plaid :) It looks great on you! I love that top Becks! I'm a fan of checks and tartan too. 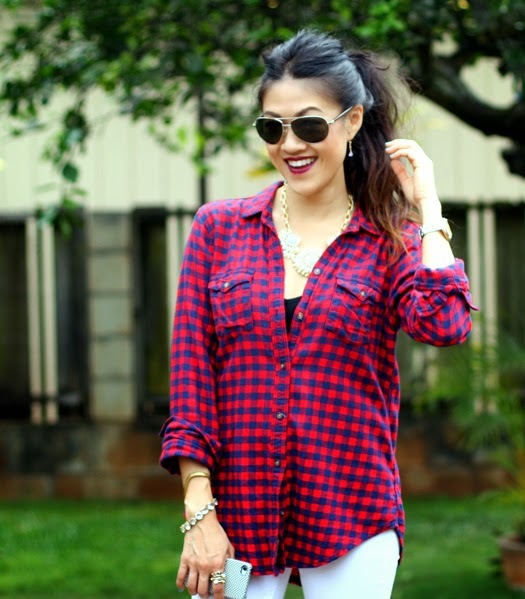 this is a cute plaid shirt, and I love how you dressed it up with accessories and a bold lip!